Be versatile. Cabinetry is formed from compressed wood with laminate finish with a solid fiberboard back for strength and rigidity. 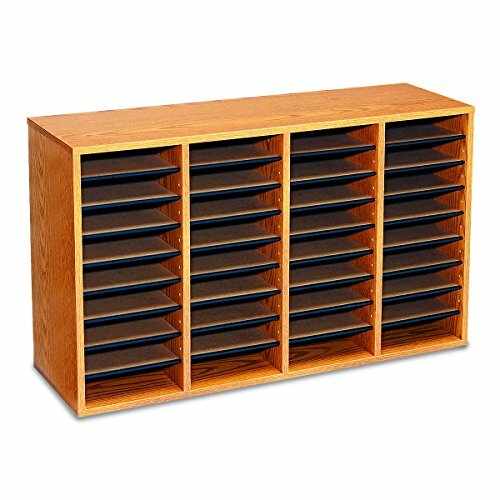 The strong hardboard shelves form up to 24 letter size compartments 9"W x 11 3/4"D x 2 1/2"H and adjust in 2 1/2" increments to increase the size of individual compartments for storage of books, 3-ring binders or personal mementos. Includes a metal rod adapter to store and organize CD's in the bottom two compartments. Black plastic molding complements finish while doubling as a convenient labeling area. Durable furniture-grade wood with stain and scratch resistant laminate finish shell. Units stack up to 3 high. Easy assembly with pre-glued dowels.